Driver commuting practices is the topic of a recent Information Collection Request (ICR) that the Federal Motor Carrier Safety Administration (FMCSA) is submitting to the Office of Management and Budget (OMB) for review and approval. The agency is required under the Fixing America's Surface Transportation Act, 2015 (FAST Act) to conduct a study on the safety effects of commutes exceeding 150 minutes on interstate commercial motor vehicle (CMV) drivers. Commuting practices of CMV drivers and policies of motor carriers. Once the report is assembled, the FMCSA Administrator is required to submit a report to Congress containing the findings. According to the agency, there are no current or future planned regulations associated with this survey, nor does FMCSA plan to actively track driver commutes to obtain data. Comments on the voluntary study must be received by OMB by June 25, 2018. All comments should reference Federal Docket Management System (FDMS) Docket Number FMCSA-2017-0313. Written comments on the proposed information collection must be submitted to the Office of Information and Regulatory Affairs, Office of Management and Budget. Comments should be addressed to the attention of the Desk Officer, Department of Transportation/Federal Motor Carrier Safety Administration, and sent via electronic mail to oira_submission@omb.eop.gov, or faxed to (202) 395-6974, or mailed to the Office of Information and Regulatory Affairs, Office of Management and Budget, Docket Library, Room 10102, 725 17th Street NW, Washington, DC 20503. 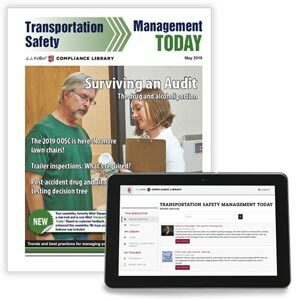 J. J. Keller's Transport Safety Pro Advisor helps you stay on top of the latest regulatory and non-regulatory issues affecting the motor carrier industry.